As 2014 comes to a close, it’s time to count blessings and announce the winners of ACW’s year-end contest to name movie titles and creatures related to the Bomb. The arms-control business is a notoriously glass-half-full/half-empty enterprise. In the spirit of the season, let’s acknowledge some positives. The stock values of nuclear weapons for major powers continued to fall after another year without mushroom clouds and nuclear testing. Vladimir Putin spent large sums modernizing his nuclear arsenal and flexing muscle while Russia’s economy tanked. Another year has passed without the explosion of a dirty bomb. Also a year of curtailed Iranian centrifuge enrichment programs – not nearly enough for some, but more than skeptics had reason to expect. A year in which India and Pakistan did not have a crisis. A year in which the framework for strategic arms reductions remained in place, despite Ukraine and Crimea. A year when Bashar al-Assad gave up much of his chemical arsenal — safely removed from a war zone. A year in which norms for arms trade have been codified. They will be broken, but it’s a start. Not such a bad year, after all. Radioactive cloud/eyes, “The Crawling Eye” — the cloud is radioactive, the reason for its existence is aliens. 1. Giant Ants from Them!, 1954, invade picnic baskets everywhere. 3. Plant-Human Radioactive Hybrid Monster from The Horror of Party Beach, 1964. Often listed as one of the worst movies of all time. 8. Survivors of Armageddon now simultaneously fight radioactive rain, a giant radioactive monster, and human folly in Day the World Ended, 1955. Director Roger Corman’s movie similarly makes its way onto worst-movies lists. 9. Avoiding their fates on the dinner plates, the crab monsters from Bikini Atoll terrorize an expedition to the islands in Attack of the Crab Monsters, 1957. Writer Charles Griffith described the pitch for the movie by nuclear-obsessed director Roger Corman as such, “Roger came to me and said, "I want to make a picture called Attack of the Giant Crabs, and I asked, "Does it have to be atomic radiation?" He responded, "Yes." 10. Roger Corman attacks movie-goers again with atomic leeches in Attack of the Giant Leeches, 1959. 13. The Class of Nuke ‘Em High, 1986, combines drug use, teenage pregnancy, and mutant radioactive squirrel-human hybrids at Tromaville High School, located next to a nuclear plant in New Jersey, as the town’s marijuana supply turns radioactive in this traumatic high school comedy-drama. Popular fan theories posit the contamination came from New Jersey’s ambient radiation and not from the nuclear plant. 14. A movie so gruesome, it was exiled from the country of its origin, Japan, Prophecies of Nostradamus, also known as Catastrophe: 1999 or The Last Days of Planet Earth, 1974, involves a whole host mutant creatures ranging from mutant cannibal human beings, leeches, trees, and flying carnivorous foxes. 16. Cannibalistic Humanoid Underground Dwellers (C.H.U.D.) wage war against the Contamination Hazard Urban Disposal (C.H.U.D.) squad in sewers of New York City over who owns the naming rights to the acronym C.H.U.D. in Cannibalistic Humanoid Underground Dwellers (C.H.U.D. ), 1984. 17. The apparent reverse-vampire in The Hideous Sun Demon, 1959, turns into a horrifying monster when exposed to the radiation of the Sun. 18. Astronauts returning to Earth hundreds of years after a nuclear war contend with their debilitating arachnophobia when fighting giant radioactive spiders in World Without End, 1956. 19. Michael Langdon breaks into stardom in I Was a Teenage Vampire, 1957. I suppose the past tense implies he got better. 20. An Air Force Major faces off against a fiend in The Fiend Without a Face, 1958. 21. Children, already a handful, are turned into radioactive children in a movie inspired by the Three-Mile Island disaster in The Children, 1980. 22. In 1977 and 2006 adaptations, The Hills Have Eyes reiterates the theory that radiation turns human beings into cannibals that stalk the desert. 23. The original Night of the Living Dead, 1968, offers radiation as a potential reason for the rise of the brain-eating living dead. 24. Creatures in the children’s show Adventure Time, set in a magical world filled with fantastical creatures many years after “the Mushroom Wars.” A discerning adult finds a horrifying future most children who watch the show will miss. 25. Duke Nukem, the yellow villain with mottled skin, represents the horror of nuclear radiation in the cartoon show Captain Planet. One of my favorite shows growing up. 26. Numerous monsters and creatures from the post-apocalyptic videogame series Fallout including Ghouls, Rad-Scorpions, and Super Mutants. 27. Numerous monsters and creatures from the post-apocalyptic videogame series set in the ruined post-nuclear Moscow metro system, Metro 2033. 28. A true monster in professional wrestling, Bryan Clark was Adam Bomb, a fallout-affected wrestler billed as being from Three Mile Island. Wrestling moves of his include the Atom Smasher and the Neutron Bomb. These entries are very, very impressive. 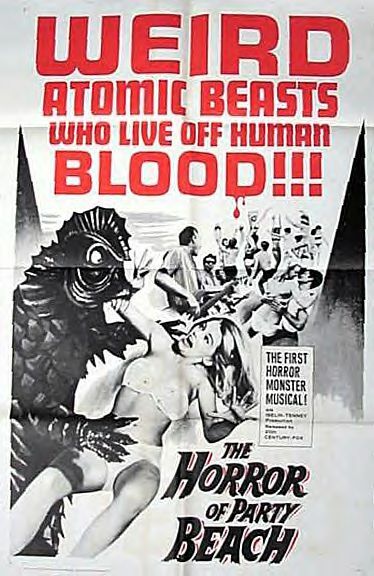 I had no idea there were so many creature features related to the Bomb. Winners: please send me your mailing addresses and the inscriptions you would like in your books. To all ACW readers: Take heart, and may the new year be kind to you and your families. Hats off to the winners. Who knew that the USA and Japan produced so many bad radioactivity-themed movies? Not to mention other cultural ephemera. I suppose Dr. Manhattan from “Watchmen” could be included, if we were to go in that direction. Just one quibble: Karen Silkwood? Nobody mentioned that the “Horror of Beach Party” was a movie monster MUSICAL. —Something else: I think a French made film (small budget) had a nuclear war take place, and the people began mutating into furniture from the radiation. I’m surprised no one argued for including the original The Day The Earth Stood Still. The robot Gort did some impressive destruction, under the direction of Klaatu, in the name of intimidating us out of the 1950’s arms race; all impelled by Klaatu’s (and the creators) amateurish remote study of humans. Really, Stalin and Mao are going buy Washington as the capital of the World? And The Day the Earth Stood Still premises galactic peace on the basis of deterrence theory.